The saga of the ARGONAUTS [ar'goh-nawtz] concerns the quest for the Golden Fleece by Jason and the crew of the ARGO [ar'goh], which included many of the leading Greek heroes from the age before the Trojan War. As a group they are sometimes called Minyae, and two cities that claimed to be Minyan were Miletus (in Ionia), which was especially active in founding colonies in the Euxine (Black Sea) area, the setting for the quest, Iolcus (in Thessaly). ATHAMAS [ath'a-mas] of Thebes married NEPHELE [nef'e-lee] (“cloud”), who bore him PHRIXUS [frik'sus], or PHRIXOS, and HELLE [hel'lee] and then returned to the sky. Athamas then married INO [eye'noh], daughter of Cadmus (see MLS, Chapter 17), who out of jealousy of her stepchildren caused a famine and, after Delphi had been consulted, plotted to have Athamas sacrifice Phrixus to end the famine. At the moment of sacrifice, Nephele caught up Phrixus and Helle and set them on a ram with golden fleece, the gift of Hermes, which carried them eastward through the heavens. Helle fell off into the strait between Europe and Asia, thenceforth called Hellespont (“Helle’s sea”), while Phrixus continued to Colchis, at the eastern end of the Black Sea. Here he was received by King AEËTES [ee-ee'teez], son of Helius and brother of Circe and Pasiphaë, who give him his daughter, Chalciope, as wife. Phrixus sacrificed the ram to Zeus Phyxios (Zeus, god of escape) and gave the Golden Fleece to Aeëtes. It was hung in a grove sacred to Ares and guarded by a serpent. Cretheus (brother of Athamas) was king of Iolcus. His son and successor, AESON [ee'son], or AISON, was deposed by his stepson, PELIAS [pel'i-as], son of Poseidon and Tyro. Aeson’s son, JASON [jay'son], was sent to the hills to be educated by the centaur CHIRON [keye'ron], and after twenty years returned to Iolcus to reclaim his family’s throne. On his journey back Jason carried an old woman across the river Anaurus, losing a shoe during the crossing. She was the goddess Hera, who thereafter favored Jason. Pelias was warned by the Delphic oracle to beware of a man with one shoe. As the price for giving up the throne, he ordered Jason to fetch him the Golden Fleece, an impossible task that he thought would get rid of Jason. The Argo [ar'goh] was the first ship, built by ARGUS [ar'gus], or ARGOS (son of Arestor), with the help of Athena. In its bow was a piece of wood that had the power of speech, taken from the sacred grove of Zeus at Dodona. Its crew (usually fifty in number) included the best Greek heroes: Jason, the leader, Augeas, Theseus, Meleager, Peleus, Telamon, Nauplius, Orpheus, and Heracles. 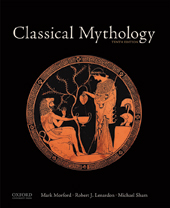 Many were fathers of Trojan War heroes, while others had special skills: Idmon and Mopsus were seers; Castor and Polydeuces were, respectively, a horseman and a boxer; Lynceus had special powers of sight; Zetes and Calaïs (sons of Boreas) were winged; Argus was the shipwright, and Tiphys the helmsman. Hypsipyle and the Lemnian Women. The Argonauts sailed to Lemnos, where the women, under Queen HYPSIPYLE [hip-sip'i-lee], had killed every male except THOAS [thoh'as], father of Hypsipyle. She put Thoas in a chest, in which he floated to the land of the Tauri (i.e., the Crimea, in southern Russia). The Argonauts stayed for a year and fathered many children. After their departure, Hypsipyle was driven by the other women from the island because of her deception in saving Thoas, and she came eventually to Nemea, where she had a role in the saga of the Seven against Thebes (see MLS, Chapter 17). Heracles and the Argonauts. The Argonauts sailed to CYZICUS [siz'i-kus], or KYZIKOS, where Heracles killed the earth-born giants (Gegeneis) who lived nearby. In a night battle they mistakenly killed King Cyzicus (after whom the city was named). At their next landfall, Cios, Heracles left in search of his companion HYLAS [heye'las], and the Argo sailed on without him (see MLS, Chapter 22). Polydeuces and Amycus. Coming to the Bebryces (on the Euxine coast) POLYDEUCES [pol-i-dou'seez], or POLYDEUKES (POLLUX), boxed against their king, AMYCUS [am'i-kus], or AMYKOS, and killed him. Phineus and the Harpies. At Salmydessus the Argonauts were received by the blind king, PHINEUS [feyen'e-us], who was tormented by the Harpies (“snatchers”), winged monsters who snatched away his food and fouled what was left. ZETES [zee'teez] and CALAÏS [kay'la-is], or KALAÏS, pursued them to the Strophades (“turn-around”) Islands, where the Harpies swore never to harass Phineus again. The Clashing Rocks. Next were the SYMPLEGADES [sim-pleg'a-deez], “clashing rocks,” between which nothing had ever passed. Forewarned by Phineus, Jason sent a dove between the rocks: as they parted after trying to crush the dove, the Argonauts rowed furiously through the gap, and the rocks were fixed ever after. Further along the Euxine coast, Idmon was killed by a boar, and Tiphys, the helmsman, died. His place was taken by Ancaeus. The Argo sailed past the land of the Amazons and the land of the Chalybes (“iron-workers”) to the island of Ares. The Stymphalian Birds. The Argonauts frightened away the STYMPHALIAN [stim-fay'li-an] birds, which had settled on the island of Ares after being driven out of Greece by Heracles in his sixth labor. Here they took on board the four sons of Phrixus (who had been shipwrecked) and sailed on to the river Phasis, on whose banks was Colchis. Aeëtes set Jason a series of impossible tasks before he would let him take the Golden Fleece. He was to yoke a pair of brazen-footed, fire-breathing bulls (the gift of Hephaestus to Aeëtes) and plough a field. In the furrows he was to sow dragon’s teeth and kill the armed men who would spring up from the teeth. Helped by Medea, daughter of Aeëtes, Jason performed these tasks and took the fleece. Medea. A priestess of Hecate, MEDEA [me-dee'a], or MEDEIA, was as skilled in magic as her aunt, Circe. Hera and Aphrodite made her fall in love with Jason, to whom she gave a magic ointment to protect him from fire and iron, and drugs to tranquillize the serpent that guarded the fleece. Euripides makes Medea kill the dragon, so that she may claim that she, not Jason, is the dragon-slayer; on a vase by Douris (ca. 470 B.C.) Jason is swallowed by the dragon and disgorged, while Athena looks on. The Argonauts set sail with the fleece and the princess, pursued by the Colchians. Their leader, APSYRTUS [ap-sir'tus], or APSYRTOS, brother of Medea, was killed on land by Jason: some say that Medea killed him on the Argo and threw him piecemeal into the sea to delay the pursuers. The Return Route. Pindar has the Argonauts sail by the River of Ocean (i.e., at the edge of the world) to the “Red Sea,” then to Lemnos and so home. In the Argonautica of Apollonius, the Argonauts sail from the Euxine up the Danube, across to the Adriatic and up the Eridanus (a mythical river sometimes identified with the Po), and across to the Rhone, down which they sailed to the Mediterranean. The Phaeacians. In this version the Argonauts confronted many of the dangers later faced by Odysseus (see MLS, Chapter 20) and came to the land of the PHAEACIANS [fee-ay'shi-anz], or PHAIAKIANS. Here Medea appealed to Queen Arete for protection from the Colchians, and the king. Alcinoüs, promised not to give them up if Jason and Medea were already married. There they celebrated the marriage, and the Colchians gave up the pursuit. The Argonauts sailed to Libya and were stranded on the Syrtes (shoals off the Libyan coast). They carried the Argo on their shoulders for twelve days to Lake Tritonis (Mopsus died in the desert) and from there made their way back to the sea. Talus. Continuing their voyage, they killed the bronze giant, TALUS [ta'lus], or TALOS, who guarded the island of Crete, by opening a vein above one of his ankles, through which his life-supporting ichor (the divine equivalent of blood) leaked out. Jason and Pelias. Finally they sailed back to Iolcus. Jason handed over the fleece to Pelias and dedicated the Argo to Poseidon at the Isthmus of Corinth. But Pelias refused to give up his throne to Aeson, Jason’s father, as he had promised. Medea and the Daughters of Pelias. Medea tricked the daughters of Pelias into trying to rejuvenate him by cutting him up and boiling him in a cauldron. They succeeded only in killing him. For this murder Medea and Jason were driven out of Iolcus and went to Corinth. Aeëtes had originally been king of Ephyra (an early name of Corinth), which he left to go to Colchis. In the original version of the saga, the Corinthians sent for his daughter, Medea, to be their queen, and through her Jason became king of Corinth. She was favored by Hera, in whose sanctuary her children (by Jason) died and were honored with a cult. In another version, the king of Corinth was CREON [kree'on], or KREON. He was killed by Medea, who left her children in the sanctuary of Hera, where they were murdered by Creon’s family after Medea had fled to Athens. Euripides’ Medea. In Euripides’ tragedy, Medea, Jason divorces Medea so that he can marry Creon’s daughter, GLAUCE [glaw'see], or GLAUKE (also called CREUSA [kree-ou'sa], or KREOUSA), and Creon orders Medea to leave Corinth. Medea sends her children with gifts for Glauce—a robe and a crown smeared with magic ointment that burn Glauce and Creon to death. Medea then kills the children as a final revenge on Jason. She escaps to Athens (where King AEGEUS [ee'je-us], or AIGEUS, had promised to receive her) in a chariot drawn by winged dragons and sent by her grandfather, Helius. Jason lives on in Corinth, where he dies, struck by a piece of wood that falls from the Argo. Medea in Athens. At Athens Medea failed to trick Aegeus into poisoning his son, Theseus (who had been one of the Argonauts), and she fled to Persia. There Medus, her son by Aegeus, founded the kingdom of Media. Medea herself returned to Colchis.